Got the urge to hone your golf skills? Do you want to teach your kids putt? Rather than having to head out to the local course, range or putting green, why not grab your putter and head out into your own backyard? NO WORRIES TURF can make a home putting green a reality for you. 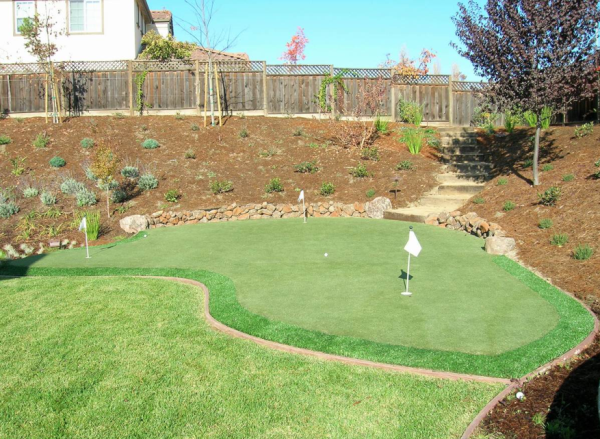 Your next landscaping project can include the home putting green of your dreams. Not only will your yard be fresh and lush all year round – you can head out the door at a moment’s notice to practice your swing, or when your children want to spend some quality time with you. Simply put, we do it best. We are the professionals’ number one synthetic green choice. No Worries regularly installs Signature Series Golf Greens, the top-of-the-line, FieldTurf brand artificial turf at golf courses. Lucky for you, our expertise is not reserved only for the professional golf course. Bring it to your own backyard! No Worries Turf design and installation team help you design the perfect synthetic putting green for your backyard. We install custom elevations, swales, and bunkers for the ultimate home golf experience. Our synthetic putting greens are of the highest quality, providing unparalleled realism in terms of surface quality and aesthetics. We also have options: are you a competitive golfer? You may want to try the Professional Golf Green. Are you more leisurely golfer? We recommend the True Roll Putting Green. This entry was posted in How To DIY Install Synthetic Grass Videos, Ideal Grass For Promotions, Landscaping and Synthetic Grass, Synthetic Grass by jordan1. Bookmark the permalink.